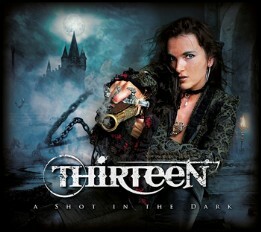 Thirteen is a joined forces of singer-songwriter Audrey Lahaije and Odyssice keyboardist-composer Jeroen van der Wiel. The first signs of life for Thirteen were taking part at the Dutch Exposure contest. The Dutch Exposure contest is an inniative by Peter Lindenbergh from FREIA Music, and with this contest he wants to help new prog-acts to reach a wider audience. Thirteen was selected from many submissions and feature with two tracks on this promotional vinyl/cd album, which was released 12-12-'12. In 2014 Thirteen released their first album entitled 'A Shot In The Dark'. On their website you can find more information about this project. This is the video to promote 'Before I Die', one of the two songs from the Dutch Exposure album. This is the lyric video to promote the new song 'My Child' from their forth coming debut album.